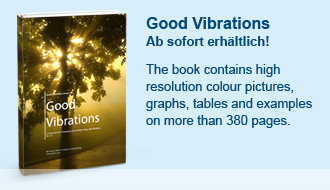 Quality Electronics Design S.A. (QED) has launched a new online book entitled " Good Vibrations ". It is a detailed introduction to vibration based durability testing. Originally released at the end of March 2014, it has now also been made available as a CD version. The book was written by Ben Haest M.Sc.Eng. who is the Managing Director of QED. It comes as the culmination of many years of experience in training vibration testing engineers, and in-depth research undertaken on the different subjects. The aim of the book is to clear up many of the misconceptions in the field. For example, typical responses such as "we've always done it like that" or "we were told to do it this way" tend to be based on second hand information and a true understanding is lacking. The PDF version of the book enables the reader to use the quick search function on any issue covered by the book. Furthermore, it can be easily installed either on a laptop or vibration control system. The 380 page book provides high resolution colour pictures, graphs, formulae, tables and clear examples. The book starts with an introductory explanation on fatigue damage resulting from vibrations, which is the basic theory behind vibration testing and explains what is happening to the Device Under Test (DUT) during a test. Shaker testing is most frequently used in such industry sectors as Aerospace, Automotive, Transport, Military and Electronics. However, the actual testing itself is carried out by vibration test engineers who will find this book invaluable as it also provides an important reference guide for design engineers who specify both tests and products. The norms and standards in the field of vibration testing are "the" reference for the definition of test specifications. However, the background and the language of the norms and standards are unfortunately not always understood. In this way the book is an excellent bridge between the design department and the test lab. The book also discusses issues such as the mechanical and the electrical installation of a shaker and alternative solutions for improving the quality and the dynamic range of signal transmission. With respect to the installation of a shaker the energy losses are both calculated and illustrated. A free Excel® file accompanies the book and provides the reader with the tools for gRMS and maximum displacement calculations of a random profile as well as calculations of displacement, velocity and acceleration for a sine profile in addition to resonance. Quality Electronics Design S.A. (QED) is based in Luxemburg and is the result of the efforts of its founder Ben Haest, a Master of Science in Electrical Engineering (Electronics) and consulting engineer. Ben has over 30 years of experience in the fields of engineering, product development, business development and management. He has provided consulting services to many global engineering companies as well as leading the development of the unique GnΩstic64 system offered by QED. Its vision is summarised in the QED motto, which is: "Whatever has really been understood can be explained in simple words". This approach has led to a range of innovative solutions and explains the words used in the subtitle of its logo "innovativ · intelligent · logisch".